STUST requires that ALL International students have supplemental health insurance. This will help to cover the cost of care that cannot be obtained on campus, especially in emergency situations where hospitalization may be required. 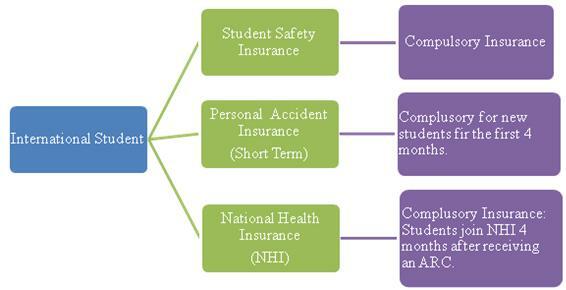 In addition, student insurance is included in tuition when students got paid which has already covered parts of costs. Morever, based on Taiwanese government law, all foreigners have to live in Taiwan longer than 4 months when they enrolled in Taiwanese National Health Insurance. Therefore, all International students should have Health Insurance in their country or buy short-term Insurance either before they came to Taiwan or after arrived. All international students MUST be join Students Safety Insurance. This Insurance provides "Minimal Coverage" for students. This insurance fee is 220 NTD each semester (subject to chang every year). Before coming to Taiwan, international students have to obtain this insurance from any independent carrier in their native countries for their first 4 months in Taiwan. This scheme will cover "Hopistal Stay, Medical Operation, Physical Disability, and Death." Foreign students who have stayed in Taiwan for more than 6 months and have been issued with ARC MUST join the NHI. Once you join this insurance scheme, you will be issued NHI card. You show the card for registration when you visit a doctor each time. STUST pays to NHI Bureau first and collect the money from registered students. Students pay from September to February in the beginning of 1st semester (749TWD*6 months=4,494 TWD) and second semester is from March to August for 2nd semester.